In the market for a powerful turnkey NAS? The general consensus is that a Synology ought to be near the top of your shopping list. The Taiwanese manufacturer has built an award-winning portfolio of network-attached storage devices, all of which are enhanced by a web-based DiskStation Manager (DSM) operating system that is widely regarded as the best in the business. We've reviewed our fair share of entry-level, dual-bay Synology units over the years, but what if you need extra storage space and an onboard CPU with enough grunt to handle 4K video transcoding on third-party apps? That's where the likes of the DS918+ come into play. Available at around the £500 mark, the DS918+ is a serious piece of kit aimed at small-to-medium businesses, or indeed enthusiast users who want to fully enhance the home-network experience. The four-bay box measures 166mm x 199mm x 223mm in size and looks entirely business-like in appearance. 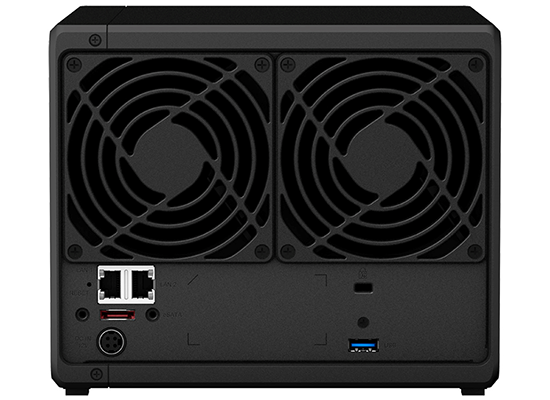 In contrast to Synology's consumer-orientated alternatives, you wouldn't want to keep this chunky unit on a living-room shelf, and it would be best placed out of view or in a dedicated server room. 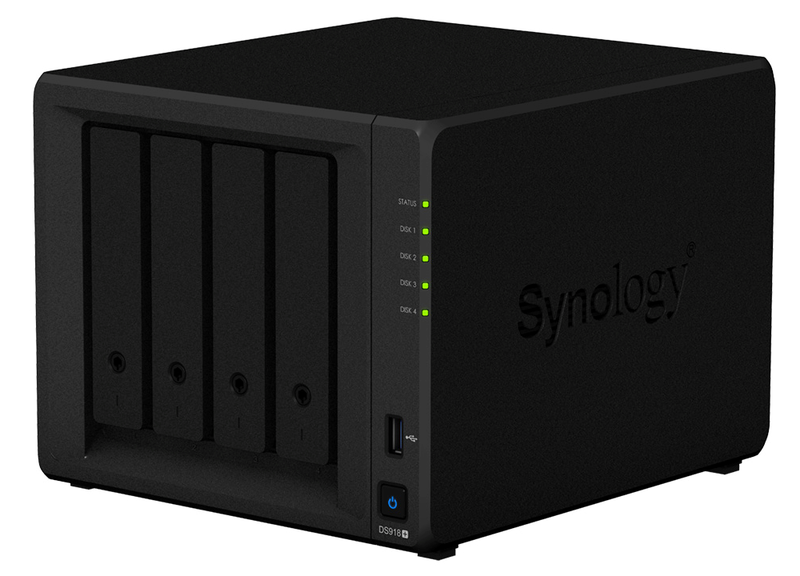 Newcomers to the world of NAS may be surprised to learn that while Synology is revered in this space, the firm's hardware is often simplistic and lacking the cutting-edge details available from competitors such as Qnap. Indeed, considering the £500 price point, the DS918+'s lockable plastic drive bays feel somewhat flimsy, there's no display output for direct-to-TV multimedia, and instead of an OLED display detailing status, IP address and other useful information, you have little more than a series of basic LED indicators located on the front-right edge. A solitary USB 3.0 is the only front-facing port, and there isn't a great deal happening around back. Here's where you'll find dual Gigabit Ethernet, supporting link aggregation or failover, eSATA for external storage expansion, another USB 3.0, and a connector for the 100W external power supply. Plenty to cover most usage scenarios, yet if you like to keep one eye on the future, you may be disappointed to learn that Synology appears to be dragging its heels when it comes to adopting 10GbE. Qnap now offers the higher-speed port on a wide range of models, but perusing the Synology catalogue reveals that baked-in 10GbE connectivity is currently only available on NAS units with eight or more bays. At the very least, we'd like to see Plus Series models offer an expansion slot for those who hope to upgrade to 10GbE somewhere down the line. A pair of 92mm fans round-out what appears to be a relatively basic shell, but on closer examination there are a few useful features worth knowing about. Firstly, the eSATA port can be used to quickly and easily attach an optional five-bay DX517 expansion unit, taking theoretical capacity up to a whopping 108TB using 12TB disks. Secondly, the underside of the DS918+ has two removable panels, each of which reveals access to an M.2 2280 slot, allowing for up to two NVMe SSD to serve as an ultra-fast system cache without using up any of the four primary drive bays. Storage options are flexible, then, and there's a good amount of horsepower beneath the hood. 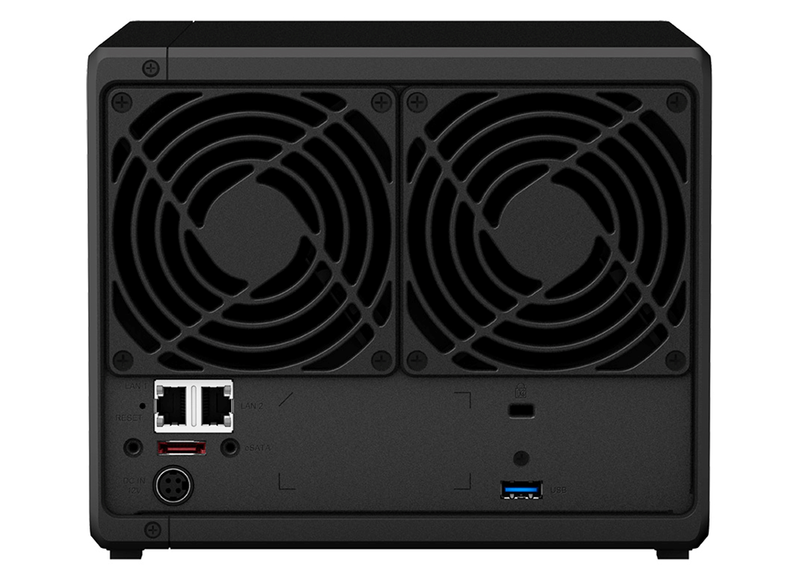 Powering the NAS is a quad-core Intel Celeron J3455 processor and 4GB of low-voltage DDR3 memory that can easily be expanded using the spare SO-DIMM accessed by removing the drive trays. It is the presence of the Intel CPU that sets the DS918+ apart from more affordable ARM-based alternatives in the Synology stable, as the 64-bit chip offers dual-channel 4K video transcoding with full support for popular third-party apps such as Plex. For this reason alone we suspect the DS918+ will prove popular among power users wanting to archive all of their Blu-rays in a digital format that can be shared with various devices throughout the home. 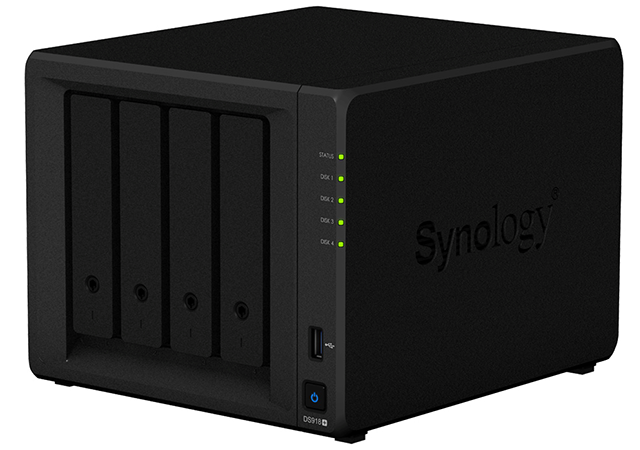 This is a capable four-bay unit, yet it is rarely the hardware that defines a Synology product. The DSM software it what brings the DS918+ to life, and the latest v6.2 release is better than ever. Accessed via a web browser, the Linux-based operating system offers a layer of polish rarely seen among its rivals. 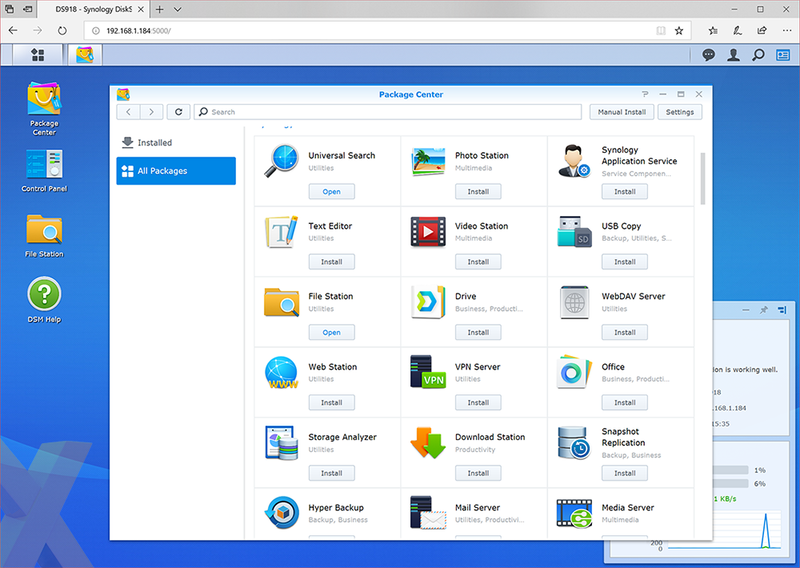 Getting up and running takes next to no time thanks to the setup wizard, and Synology has managed to create an interface that suits both novice and expert users. Can't figure out what RAID actually does? Then Synology Hybrid Raid (SHR) will automate the process with one- or two-disk redundancy, and the handy ability to mix-and-match drives of different sizes. Prefer to manage your own storage pools and volumes? That's fine, too. DS918+ supports JBOD, RAID 0, RAID 1, RAID 5, RAID 6 and RAID 10, there's the ability to safeguard shared folders with 256-bit AES hardware encryption, you have a choice of EXT4 or Btrfs file systems, plus with support for over 2,000 user accounts and Windows ACL integration, you won't be short of options. NAS management frankly doesn't come much better than this, and in addition to the wealth of features baked into the OS, the integrated Package Center opens more doors via a broad array of add-on apps. Looking for a download manager, a mail server, a DLNA media server or the ability to host your own Wordpress blog? The Synology will do it and that's merely scratching the surface. High Availability Manager can be used to pair two NAS units in a cluster, there are more backup options than you're ever likely to need, and with Virtual Machine Manager you can run multiple virtual machines on the NAS itself. 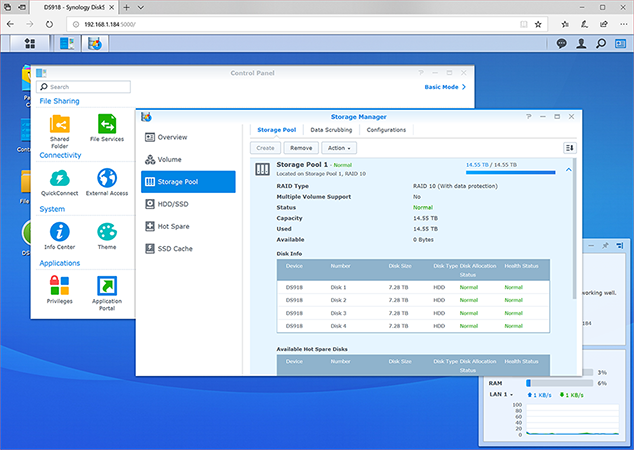 Some of these more advanced features may require doubling-up on RAM in order to function at their best, but if you're wondering why a Synology costs more than a home brew server you could make yourself, it's worth spending a few minutes in the free DSM 6.2 demo.